Check out the Sony 85mm F/1.4 Carl Zeiss Planar review. 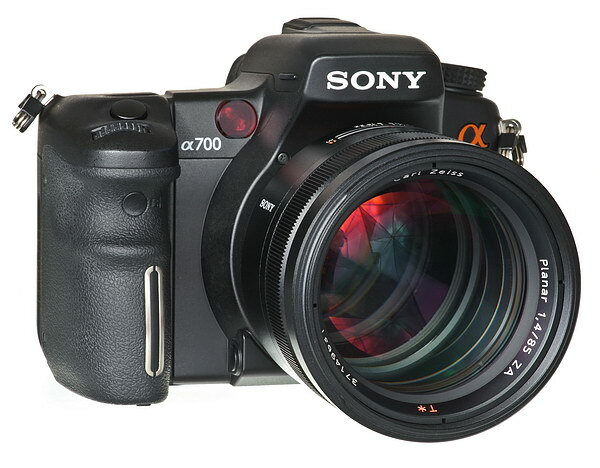 This is an expensive special use lens aimed at advanced amateurs, as well as professional photographers. Uses include portraiture work, and available light, hand-held shooting. This very well built lens is sharp wide open, but exhibits normal veiling haze and axial color fringing at F/1.4-2. Big deal, when used for its intended purpose, it's a great lens, shooting test pictures at F/1.4 in broad daylight is not the proper use. Don't buy this lens if you want to take pictures of newspapers or test charts, for that, get the Sony 50mm F/2.8 macro lens. I have a new Favorite links page now located on the Nav bar to the left. It's incomplete, so I'll be adding to it occasionally, until I get them all up and organized. Look for the Sony 85mm F/1.4 review sometime next week. I'm running it through the paces right now. I have a couple of updates, one of them way overdo!! 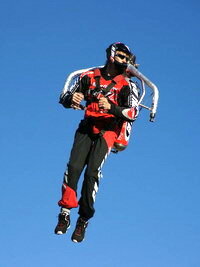 But first, check out the guy cruising through the neighborhood with a jet pack on! Click the picture for a quick tour and explanation. Next, and the one way overdo is the lens review methods and terminology page. This page explains what's behind the lens reviews, the procedures and terms used. If you've ever wondered what the crap I'm talking about, check it out, and let me know if it helps. The permanent link will be on the lens review page. Sony has raised the prices of their lenses back to where they were last fall. I'm not sure this is a good idea, as many of the lenses were over priced at that reduced rate!! Maybe they're trying to head off deflation. Well, we'll keep an eye out in the coming months to see if ther're any cracks in the S.U.R.E (Sony unified resale execution) plan. If they drop that, it would be a SURE sign of trouble. 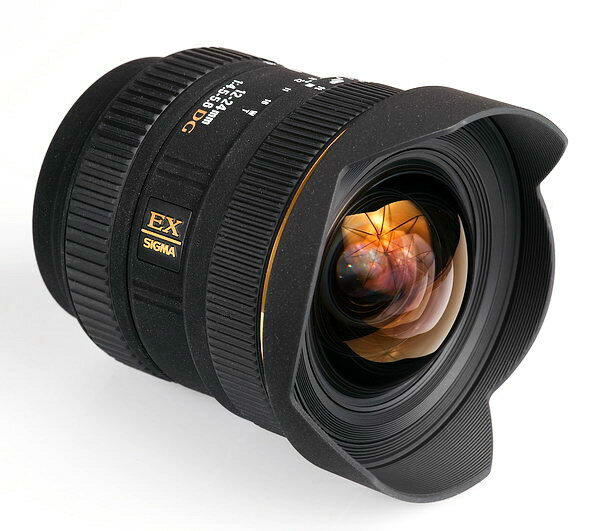 Check out the review of a "really wide" wide-angle zoom lens, the Sigma 12-24mm F/4.5-5.6. I got carried away again, (didn't I just say that?) and posted quite a few pictures, so dial up users be patient. I finally lucked out and picked up a good Sigma lens without having to send it back immediately for warranty work! One outta four ain't bad. Full frame ultra wide-angle nuts need to go out and buy this lens, it turned in a very good performance, though the focusing is not as good as Sony, but that's normal. This lens has been reviewed on other sites, and they didn't give it a very high rating, usually soft corner issues, big deal. If you understand the limitations of a lens like this, you'll appreciate the optical performance much more. The corners are pretty good on my copy, even with full frame coverage. It has typical Sigma flare like the 10-20mm, but there're ways to mitigate that. Click the picture to read the review and see if this lens is right for you. I got a little carried away with the lens reviews updates, and decided to include some MTF charts (on G and CZ) and internal lens illustrations on most Sony lenses. Go here for an example, and scroll down to the last product shots. I pulled these from the Sony pdf lens & accessories brochure, though Sony hasn't updated it since the Carl Zeiss 16-80mm came out, so there're about six lenses missing. Funny, the chart still shows "the complete line..." with stuff they don't even sell anymore, like the A100, F36AM and F56AM flash units. Earth to Sony; time for a little brochure make-over. I've also implemented more consistency in my reviews when describing certain test results with words such as "harsh," "moderate," or "soft" etc. The discrepancies are more apparent when reading through a number of reviews quickly (like recently) than when I'm writing a review up every few weeks or so. Speaking of which, up next is the super ultra-wide Sigma 12-24mm F/4.5-5.6 review, look for it late this week. I've finished all the full frame lens reviews, so there's no gap in results anymore. I'm re-checking all the "DT" lenses for any inaccuracies, then I'll move on to more lens reviews. Proof reader Andy; I updated the Minolta TC compatibility paragraph!! Thanks. Also, I moved the October home page entries to the Home page archives, so if something you liked disappeared towards the bottom of the page, go here. The last two full frame updated lens reviews are below. I had some trouble with the Sigma 105mm F/2.8 macro in long distance focusing, so I changed part of the review, look for the bold text below the center crops and full frame section.